An odd, six-sided, honeycomb-shaped feature circling the entire north pole of Saturn has captured the interest of scientists with the Cassini mission. This atmospheric feature was already imaged by NASA’s Voyager 1 and 2 spacecraft over two decades ago. The fact that it has appeared in Cassini images indicates that it is a long-lived feature. A second hexagon, significantly darker than the brighter historical feature, is also visible in the Cassini pictures. 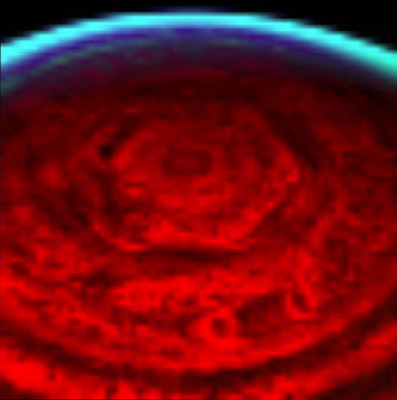 The spacecraft's visual and infrared mapping spectrometer (VIMS) is the first instrument to capture the entire hexagon feature in one image. The hexagon is similar to Earth’s polar vortex, which has winds blowing in a circular pattern around the polar region. On Saturn, the vortex has a hexagonal rather than circular shape. The hexagon is nearly 25 000 kilometres across. Nearly four Earths could fit inside it. The new images taken in thermal-infrared light show the hexagon extends much deeper down into the atmosphere than previously expected, some 100 kilometres below the cloud tops. A system of clouds lies within the hexagon. The clouds appear to be whipping around the hexagon like cars on a racetrack. The Saturn north pole hexagon has not been visible to Cassini’s visual cameras, because it’s winter in that area, so the hexagon is under the cover of the long polar night, which lasts about 15 years. The infrared mapping spectrometer can image Saturn in both daytime and nighttime conditions and see deep inside. It imaged the feature with thermal wavelengths near 5 microns (seven times the wavelength visible to the human eye) during a 12-day period beginning on 30 October 2006. As winter wanes over the next two years, the feature may become visible to the visual cameras. Based on the new images and more information on the depth of the hexagonal feature on Saturn, scientists think it is not linked to Saturn’s radio emissions or to auroral activity, as once contemplated, even though Saturn’s northern aurora lies nearly overhead. So, there is still plenty to do for the scientists to solve the puzzle. Saturn's 'hexagon' appears to have remained fixed with the planet’s rotation rate and axis since first glimpsed by Voyager 26 years ago. The actual rotation rate of Saturn is still uncertain. “Once we understand its dynamical nature, this long-lived, deep-seated polar hexagon may give us a clue to the true rotation rate of the deep atmosphere and perhaps the interior,” concluded Baines. Written from a news release by ESA.